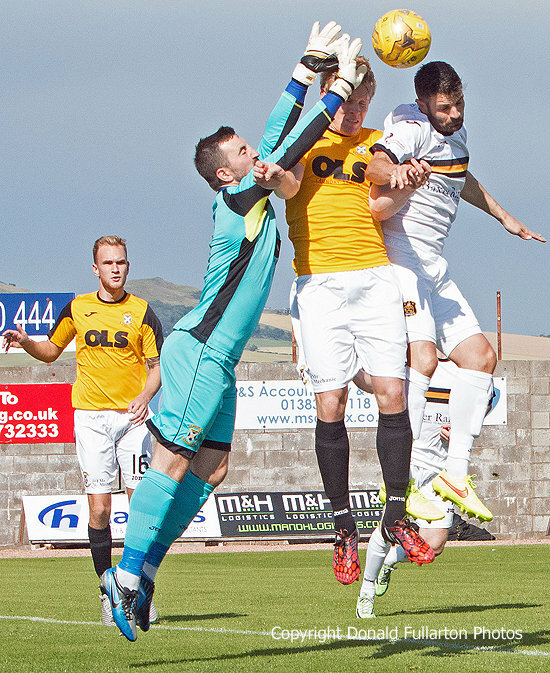 DUMBARTON exited the Scottish League Cup in the first round — losing a penalty shootout to League 2 side East Fife at New Bayview. A 461 crowd saw an entertaining game, with player manager Gary Naysmith's side not at all overawed by their Championship opponents. The home side opened the scoring early in the second half when lanky striker Nathan Austin coolly lobbed keeper Mark Brown from distance, but Sons soon replied. New striker Steven Craig, who last played for Wycombe Wanderers at Wembley in May, came on for Garry Fleming, and his challenge for a cross (pictured) led to a mistake by the home keeper which allowed Kevin Cawley to net the equaliser. The visitors dominated for much of the match and missed several chances, both in normal and extra time, although Craig looked dangerous up front. When it came to the penalty shootout they squandered a two goal advantage, and in the first sudden death round Kevin Cawley failed to equalise, bringing delight to the home team and fans.